The ripeness and potential of ‘Your Name’ in particular as a fitting candidate for this framework of analysis, can be best and simply argued by its dominance in the domestic and international box office, being the highest-grossing Japanese animation film in history; surpassing the title’s previous holder, Hayao Miyazaki’s ‘Spirited Away’. The sheer and demonstrated resonance of the film’s story and in turn its success in expressing Shinkai’s fantastical study and celebration of Japan’s dualistic sentiments of tradition and modernity, would be sound argument that ‘Your Name’ is a Japanese creative industry success story that is (however incidentally) integrated with Cool Japan’s desired deliverables. Of course, it is also imperative to note the mirroring implications of this essay’s focus on ‘post-disaster’ Cool Japan and the choice of ‘Your Name’ as the subject of choice: Valaskivi’s paper focused on the 2011 ‘Creating a New Japan’ proposal, which was published by the Cool Japan Advisory Council two months after the March Tōhoku earthquake and tsunami, thus giving the article a specifically time-stamped perspective that marries nation branding with post-disaster recovery efforts. Shinkai also noted his inspirations taken from the earthquake and the film’s parallel disaster event; namely a meteor that crashes into the fictional town of Itomori being a key thematic component (Leader, quoting Shinkai, 2016). It is crucial to note this detail’s importance, as it will act as this essay’s concluding framework of study on the film. 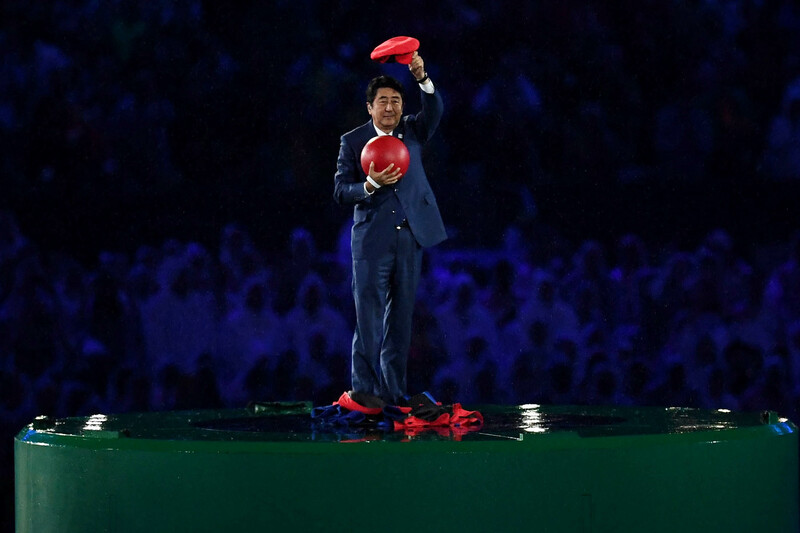 During the 2016 Rio Olympics closing ceremony, Japan’s prime minister Shinzo Abe emerged on a worldwide stage in a Super Mario costume, intended to be the nation’s formal welcome to the world as 2020’s Olympic Games host. What is curious about this choice of attire had nothing to do with the supposed ‘immaturity’ of using a Japanese children’s video game character that was in turn a stylised and retro Italian stereotype, as the national mascot, but how…logical and economically integrated such a choice actually was: one of Japan’s numerous claims as the modern cultural export giant is grounded within Nintendo and the iconography of the video game company’s host of video game characters (Mario, Princess Peach, Link, Princess Zelda, etc); a central commodity that maintains and markets Japan’s cultural capital. Taylor defined their concept of the social imaginary as ‘the ways in which people imagine their social existence, how they fit together with others, how things go on between them and their fellows, the expectations that are normally met and the deeper normative notions and images that underlie these expectations.’ (p.106) Therefore, to define nation branding is to acknowledge the conscious deliberacy in its projects as effort to influence the social imaginary of a nation. Through the circulation of the transnational idea of nation branding and its various local practices, a particular social imaginary gets formulated, represented, and reproduced; through these processes, it is also transformed. It is through the circulation not only of images, representations, meanings, values, and practices, but also of people and objects, that a community formulates, maintains, and reformulates its values and shared understanding of identity in the social imaginary. In other words, the society is held together, and the social imaginaries are created and maintained through circulation (Valaskivi, 2013, p. 486). Thus, it can then be argued that Japan’s nation branding is indeed not just sandwiched within the Cool Japan initiative: the formulation of social imaginary is a nation-wide constant circulation of influence and repetitive reinforcement, and Cool Japan moreso acts as a politically driven solidifier; a condensed summary. But the question remains: how does the film ‘Your Name’ contribute to Japan’s social imaginary? What ‘uniquely and singularly Japanese’ values, narratives, practices and parables were communicated and circulated by Shinkai’s film? ‘Your Name’s story revolves around a young high school boy and girl who mysteriously swap bodies on a regular basis: they would alternate between each other’s bodies every day after waking up. The boy, Taki, lives in the urban sprawl of central Tokyo, where he would attend school, work his part-time job at a high-class Italian restaurant as a waiter, and aspires to be an architect. The girl, Mitsuha, lives in the countryside town of Itomori, nestled in the mountainous Hida region. Mitsuha is the daughter of the town mayor and comes from a family that is heavily tied to the traditions of the Miyamizu Shrine, which serves the town’s local deity. As the story progresses, both characters’ experiences, which are integrated and intertwined with each other across time and space, allows them to reenergize their sense of self and connection to a communal whole, all the while adding to Shinkai’s grand meta-narrative of the universal desire of ‘being someone else’ and the co-inhabitation of nostalgic traditions and transformative modernity. On a surface level, ‘Your Name’ contributes to a grander image of Japan by generating highly appealing landscapes and instantly recognisable ‘symbols’ of Japanese culture. Shinkai’s film exerts a uniquely fantastical and ‘hyperrealistic’ visual language that depicts the city of Tokyo and the town of Itomori with intense and well-research detail and elegant vibrancy. Tokyo’s relentless pace and contemporary urban sprawls is exemplified by shots of interlocking train-lines (incidentally a well-worn symbol of modern Japan, one that is consistently utilised by Shinkai throughout his career as a major signifier of progress’s relentless hustle), bustling stations and streets, and the tinkling ‘high class’ of western brands and Italian restaurants. Itomori; while a fictional town, is an amalgamation of extensive location scouting and laborious artistic processes which depicted it as a sacred, calm and spiritual holy ground, but still retained its raw laid-back casualness, being a lazy small town surrounded by the Hida mountains. Japan’s social imaginary being depicted here, is what I’ve previously described as a dualistic construct of urban excess and rural ephemera (keep note of this deliberately chosen word). Susan S. Noh’s dissertation ‘Nostalgia in Anime: Redefining Japanese Cultural Identity in Global Media Texts’ posits in particular, the modern ‘delicacy’ and capitalistic transformation of the journey, the pilgrimage, and contextualised it through Shinkai’s cinema (2017). Indeed, Cool Japan can be essentially diagnosed as the capitalisation of culture. An even more sceptical reading of Cool Japan’s nation branding efforts would be Valaskivi’s cautioning: ‘What is rarely realised is that the very act of perceiving the nation as a brand already changes the social imaginary of the nation as such: a country becomes an object of consumption, a brand, a commodity, a product. Consequently, the nation is imagined as a commodity, rather than as a community’ (p. 499). The argument here stands on the implications of nation branding and what that entails for policy making: ‘a nation that brands itself is a nation that imagines itself as a product for consumption, rather than as a democratic community in which the government’s task is to distribute public resources to create maximal well-being for the maximal amount of people. A product for consumption is advertised for those who can consume and who are interested in things that are cool’ (p. 500). The concept of ‘cool’ is indeed an integral part of this discussion, but its exploration will be left for later. As mentioned before, Noh’s integrated study of ‘Your Name’ and the pilgrimage’s postmodern place in Japan (and indeed, the world) is holistically commentative of Cool Japan in terms of repeating patterns of history, namely the Japanese tourism advertising agency in the 70s and their framing commercialisation of national travel as ‘finding themselves’…or encouraging people to discover what’s lacking in their cultural identity, and in turn desire to rediscover ‘the true Japanese self’ by ‘moving through the originary landscapes’ (Ivy, p. 41). The Discover Japan movement’s connection here is two-fold. First: expanding upon the previous section’s discussion on ‘Your Name’s ludicrously beautiful landscape, object and architectural designs and how it creates a polished ‘desirable’ image of Japan, Cool Japan branded a free Seichi Junrei (Holy Pilgrimage) tour under Shinkai’s film, by offering tourists the opportunity to visit ‘Your Name’s featured locations in the Hida region and Tokyo (Komatsu, 2017). This idea of the ‘anime pilgrimage’; fans of certain media products taking a trip to visit foreign locations featured in virtual products, is certainly not new (see Norris’s study  on the peculiar Japanese media pilgrimage site at a Tasmanian bakery, which had a striking and coincidental resemblance with the bakery featured in Hayao Miyazaki’s film ‘Kiki’s Delivery Service’, a place where the titular character lived and worked in), but it does lead me to my second connection: the concept of the ‘virtual pilgrimage’. In the film, Taki and Mitsuha’s body-swapping antics and their subsequent adventures leads them through several Japanese locations, ranging from ancient spiritual sites steeped in nature and nostalgic fantasy, to the sprawling heart of Tokyo. Taki’s journey lends itself to another future idea thread which I will be elaborating on later: restorative nostalgia. That being said, his journey to ultimately reconnect with the past; searching for Mitsuha, the girl from his memories, with whom he shared his literal life and body with, and whom he was ultimately doomed to forget, through a spiritual pilgrimage that leads him to the ancient site of a natural disaster, is not unlike the advertised ‘self-discovery’ and fantastical journeys advertised by ‘Discover Japan’. Therefore, the result of Shinkai’s approach to filmmaking, his style of foregrounding the awe of the landscapes of Japan lends itself well to the iconography of the Japanese social imaginary. A fitting way to conclude the thread that I started with Abe cosplaying as Super Mario would be to discuss what I refer to as the ‘Cool’ Oxymoron. As mentioned before, one of Valaskivi’s key frameworks of contextualising Cool Japan is the concept of ‘cool’. ‘Cool’ implies youthfulness, authenticity, trendiness, and creativity. Even more importantly, cool implies a rebellious attitude towards authorities. Through the concept of ‘cool’, deviant and counter-cultural elements become desirable and attractive (Valaskivi, p. 492). And herein lies the oxymoron of nation branding on the basis of ‘cool’: Japan’s media culture and it becoming resonant amongst the youth, namely otaku media such as anime, manga and video games were; at least as argued by Valaskivi here, due to its domestic and international status as being ‘rebellious and cool’. Therefore, there is an argument that can be made, that Cool Japan sending Abe to Rio with a Super Mario costume would be a sign of ministerial acceptance: in the eyes of popular culture fans, what was once cool actually becomes less trendy or even ‘lame’ once there is ministerial involvement (p. 494). In contrast, Cool Japan’s third and final main circulating idea of nation branding revolves around ‘essential’ Japanese values, which seeks to unite the population together under the same banner of uniquely Japanese values that they traditionally possessed; values which define Japan: ‘spirituality, empathy, receptivity and vitality’ (among others) (p. 498). The post-disaster framework of rebuilding Japan under these values were intended to be communicated to the world in order to regain competitiveness and visibility on the global stage (Valaskivi, quoting Cool Japan Advisory Council 2011, p. 3). What can be noted here once again, is the dualistic conflict between the Japanese youth’s urban rebellion and search for a unique identity, and the myth-building foundations of traditions and passed-down rituals that grounds one’s cultural identity. ‘Your Name’s two youthful main characters and their adventures chaotically navigate this cultural divide through the aforementioned body-swapping, as well as a grandstanding meta-commentary that proposes a peaceful co-existence and even mutual reliance that is to be the way for true progress. Having grown up in a traditional and strict family, Mitsuha’s occupation as a shrine maiden designates her as a metaphorical representation of tradition and Japanese spirituality. However, her main drive throughout the first half of the film was a lust for modernity: she constantly laments her boring life in the countryside, longing to live and relish in the pleasures of urban life. In contrast, Taki’s story takes him in the opposite direction. As a boy living in Tokyo, with aspirations to becoming an architect and is currently working at a high-class Italian restaurant, Taki is a consequent metaphorical representation of Mitsuha’s wish: youthful modernity and aspirations of being part of progress. Having experienced a life as a girl living in the countryside, and having gained a desire to find her again, he embarks on a pilgrimage that takes him into the past. Shinkai’s manifesto; that progress in Japan can only be truly achieved through the preservation and continued evolution of tradition and modernity, was demonstrated by how neither character’s stories and progress could’ve existed without the other. Which brings me to the final segment of this essay. In an interview, Makoto Shinkai outlined his inspirations and what he wished to convey with ‘Your Name’. He cited the 2011 Earthquakes: “You never know, Tokyo might go tomorrow – and I think everyone in Japan is aware of that. That can happen, and it has happened. You can lose that everyday, normal life. So, I wanted to create a story of recovery. You can’t change the past in real life, but you can change the past in a movie” (Interview by Short, 2016). The meaning behind Mitsuha’s shrine maiden duties may have been lost, but these…repeated motions, the rituals, are still retained to build and maintain a communal identity. While the original ‘meanings’ were lost…at least the potential and creativity is still there to allow for reinterpretation. This is posited by Boym’s concept of restorative nostalgia, which marries the unreliable semiotics of nostalgic retrospect with the fluidity of interpretation, which allows for a constant that can survive beyond destruction (p. 44-45). Taki’s main mission to find Mitsuha, upon discovering that his connection with Mitsuha was spliced through time, and that she perished three years ago in his timeline due to the meteor strike, was soon transformed into a rescue mission for the entire population of Itomori. The illustrated danger and pain of losing one’s connection with one’s origins and history is mirrored by Taki’s torture of losing his memories of Mitsuha before completing his mission. To conclude, the definitive argument for the role of nostalgia and fictionality in the formation and representation of the ‘Japaneseness’ of ‘Your Name’, that ultimately…in Shinkai’s fantasty world, Taki’s connection with modernity helps Mitsuha finds her resolve to save herself and the town, establishing a new timeline where everyone lives. Taki reached Mitsuha through a spiritual pilgrimage, and Mitsuha found her resolve through her connection with a boy from the future. Shinkai’s final message. Perhaps now one can better appreciate the enduring hopefulness of Makoto Shinkai’s film, and how this hopefulness and enduring positivity forms the basis of a new social imaginary for Japan. The fantastical nostalgia of Shinkai’s filmic world is not the product of…economically motivated desires of nation branding, but it is conclusively revealing that in the post-disaster world, ‘Your Name’s resonance with the international consciousness is highlighted by the enduringly ‘Japaneseness’ of its narrative, its thematic world: an imaginary but undeniably real world that sells a vibrant Japan. Boym, S. (1959). The Future of Nostalgia. Basic Books, New York. Dinnie, K. (2009). Japan’s nation branding: recent evolution and potential future paths. Journal of Current Japanese Affairs. Fujita, Y. (2011). Fabricating Japaneseness? The identity politics of young designers and artists in global cities. International Journal of Japanese Sociology. Ivy, M. (1995). Discourses of the Vanishing: Modernity, Phantasm, Japan. University of Chicago Press. Iwabuchi, K. (2007). Bunka no taiwaryoku: soft power to brand nationalism wo koete. Tokyo: Nihon Keizai Shinbun Shuppansha. Iwabuchi, K. (2008). East Asian Pop Culture: Analysing the Korean Wave. University of Hong Kong Press. Kohler, C. (2016). Power-Up: How Japanese Video Games Gave the World an Extra Life. 2nd Edition. Dover Publications, New York. Taylor, C. (2002). Modern social imaginaries. Public Culture.